The Anantapur average altitude (elevation) 273 meters above sealevel. 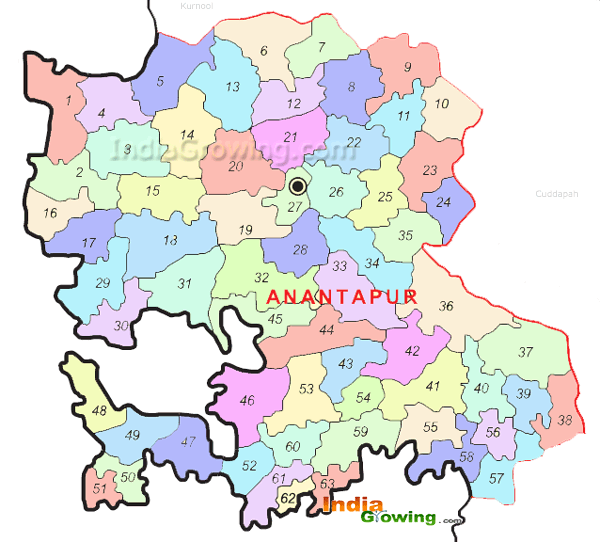 The Nearest Airport to Anantapur is Rajiv Gandhi International Airport.The Collectorate office for this district is Collector Office, and other popular district head offices are APIIC, Zonal Office, Rural Development Trust Office, Prl.District Court, District Cooperative Office, District Sub Registrar Office, The nearby Fire service for this district is Fire Station. The District Library is JNTU Library.The Head Post office for this district is in Indian Post. and the Railway Station is Anantapur (station). In this village facing the drinking water problma.. and some peolpe inwalthe maaka and plying card .. Respected Sir,we want Sakshi paper. I will paid yearly contribution. Kindly inform how much cost yearly payment. who is our sales manager inform me and send me mobile number sir. No drains and not improvement. Tress are only 10% available. Country is developed but but former's are backward. My village is very beautiful place. My village name "yendu nidimamidi ". Temples " nidimamidamma" , "veerabadra swami " , "Anjineya swami" , more than templea. Hii This Is Viswanath. My village Is a Very Beautiful.My Village Is The Famous festival and temples is there.My Village In The Famious God IN Shiva And VANNURSWAMY.Very Beautiful And Powerfull Gods in palyam village.Palyam Village Near By Penna River Is There. Hi sir iam Jagadeesh from sankaragal.rallhalli their is no bus service to our village kindly provide apsrtc bus service we are facing lot of problums. Garudachedu village is a peaceful village, but the leaders and the officers are not caring the problems of people who are living in this village .Some of the problems which are facing by the peoples are street lights on the night.and drainage which is to be flowing on the roads continuously are the main problems. So I request you the officers who are reading this comment please solve the problems as early as possible. Tundra Bhadra HLC canal is flowing besides Kanekal town. And Storage Tank water taken away toRaidurgh town for drinking purpose. But still today there is no HLC water to drink Kanekal people. Here people drinks floried water and Suffer from floried diseases. In kanekal URDU school there, but it is in inconvenient to students, due to it established in interior place. Here Muslims are in majority population. The main road is completely damaged which laid in the year 1980, still today the road works not taken by Mandala Panchayat or the Government. Kesapuram peopls very good Helping nature..and Good unity of savarnity .. moust of the encoragement sri sathaya sai baba charatabul trust in puttaparthi ...trust was a Free education and materials Free watar Free hospitals and medistions... Very good devotion... Of the peoples.... kesapuram. From yeraballi naresh..
My village is very back position on festivals. PALYAM IS A VERY BEAUTIFUL VILLAGE.THE VILLAGE IN FAMOUS FESTIVAL IS THE MOHARAM. THE VERY POWER FULL GOD AND IS ONE AND ONLY KING IN VANNURSWAMI .